Outside The Interzone: "I Have Been, and Always Shall Be, Your Fan." Today is a loss... if I don't do this (and I really don't want to, but I need to work toward closure), I won't get anything else done. 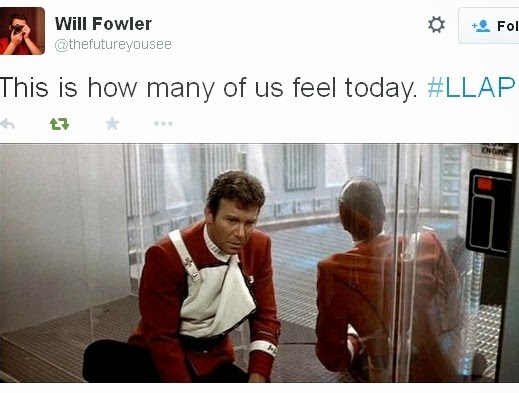 It was announced earlier that Leonard Nimoy has passed away. 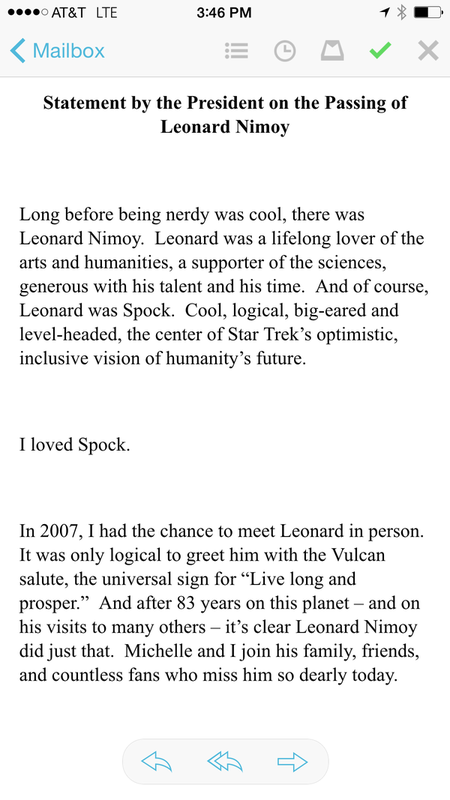 To which I responded (from this post nearly six years ago), "Obama's statement on Spock is, of course, logical." Star Trek TOS (The Original Series) started airing in fall of 1966, at a point in time when our family did not have a television. But I saw it occasionally at friends' houses, and of course, heard about it at school. At Christmas of 1967, when I was in 3rd grade, our family did get a small, black and white TV. Star Trek became the show I tried to never miss. The show only rarely achieved "greatness," in terms of what older me would come to require of "great" science fiction, but for 8-year-old me, it was perfect. 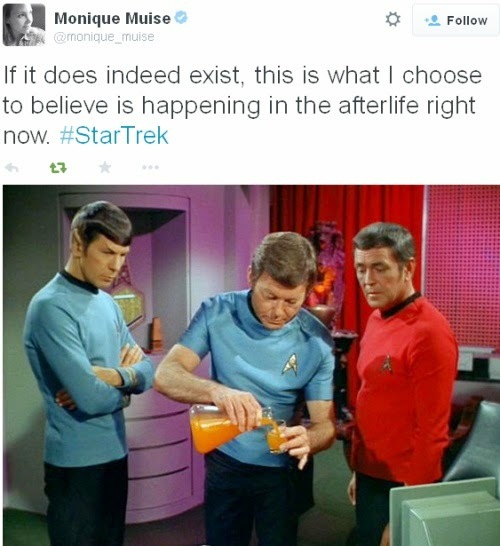 And as a kid who was inclined toward science from my earliest memories, Spock was the character I gravitated toward. Level-headed and knowledgeable, he was what I aspired to be. Flash forward to the seventies, syndication and high school. Reruns reran every weekday at 5 PM... and I rarely missed them. In fact, I audio-recorded the entire series. I basically had the series memorized. 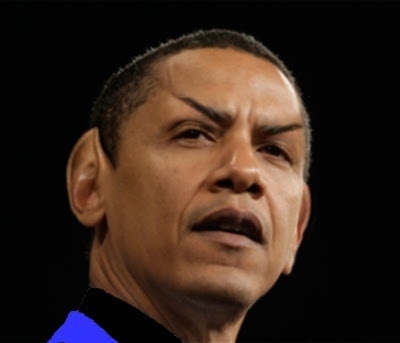 And Spock became even more the center of my attention. Dealing with the emotional BS of puberty, I saw in him a model I could emulate. I could experience these intense emotions, but not let them harm me or those around me. It wasn't exactly healthy, for a human person, but it was a strategy for coping with what felt like insanity. It was one that allowed me to empathize with others, but (hopefully) spared others the pain I experienced. From "City on the Edge of Forever:"
McCoy: "You deliberately stopped me, Jim! I could have saved her! Do you know what you just did?" Spock: "He knows, Doctor...He knows." In that scene, you can see that Spock is intensely aware of, and is pained himself, by the grief Kirk is experiencing from witnessing the death of the woman he loved, yet remains committed to the reality of what had to happen. That was what I aspired to. Another episode (the above is generally argued to be the "best," and I tend to agree) that was my personal favorite, was "The Devil in the Dark." Miners are being killed by some kind of ferocious beast, so the Enterprise arrives to try to protect them. It turns out, the miners are unwittingly committing xenocide against a race of intelligent, peaceful, and logical rock-burrowing creatures called "hortas." Spock mind melds with the last surviving horta, and explains the situation to the crew and the miners- which leads to a fruitful partnership for all. I have no doubt this episode played a major role in creating a positive attitude toward geology for me. Did it "inspire" me to be a geologist? Almost certainly not. Did it make geology something I was more eager to investigate when I had the opportunity? Almost certainly. I can't draw the line in there, but it was a big influence. 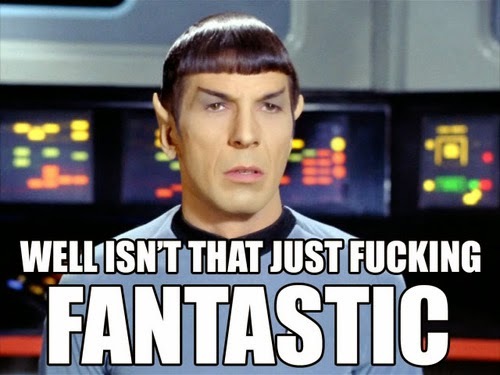 And once again, Spock was what I aspired to. Kirk: "We are assembled here today to pay final respects to our honored dead. And yet it should be noted that in the midst of our sorrow, this death takes place in the shadow of new life, the sunrise of a new world; a world that our beloved comrade gave his life to protect and nourish. He did not feel this sacrifice a vain or empty one, and we will not debate his profound wisdom at these proceedings. Of my friend, I can only say this: of all the souls I have encountered in my travels, his was the most... human"
Well said. I am not sure I know how much his character inspired me, but I do know that it was for the better. That scene was brilliantly acted. Nimoy's genius was to play it almost exactly like Good Spock: same inflections, same utter mastery of himself; just the slightest edge in his voice when he realises Evil Sulu is plotting against him. Freakin' _terrifying_. The fact that Spock turns out to be the seed of revolution at the end is entirely plausible. All these years later, I find it fascinating (so to speak) that of all the humans in play, Spock was the only character with the vision to look beyond immediate reality, and ultimately the only one whose morality wasn't determined by others' expectations. And all of that, Nimoy communicated without communicating. If it's true that Leonard Nimoy's career came down to one character, the way he played it, that one character was worthy of a whole career.